This month we’re celebrating the talents of that pulp stalwart—Joe Archibald. 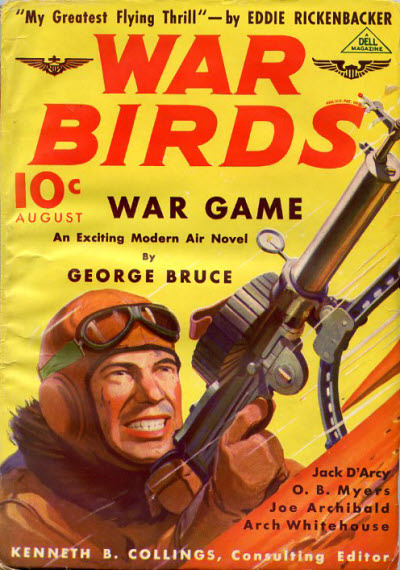 Archibald wrote hundreds of stories for the pulps, both dramatic and humorous. His bread and butter it would seem was the humorous tale. He had long running series in several pulp titles. In the detective titles there was Alvin Hinkey, the harness bull Hawkshaw, in 10 Story Detective; Scoops & Snooty, the Evening Star’s dizzy duo, in Ten Detective Aces; and the President of the Hawkeye Detective Agency himself—Willie Klump in Popular Detective. While in the aviation titles he had Elmer Hubbard and Pokey Cook in Sky Birds; the pride of Booneville—Phineas Pinkham in Flying Aces; and the one-two punch of Ambrose Hooley & Muley Spinks in The Lone Eagle, The American Eagle, Sky Fighters and War Birds! The Ambrose Hooley stories are written as if Muley Spinks were telling us the tale, describing Hooley as a sawed off little tomato who is a demon in a Spad and dynamite with his fists on the ground. Hooley is frequently working some angle at the 93 Pursuit Squadron and getting their C.O. Major Bertram Bagby’s Hackels up. A listing of all Joe Archibald’s Ambrose Hooley & Muley Spinks tales. He was washing out ships at fifteen thousand dollars a washout—but Ambrose was determined to win the war along with the heart of a girl in Kansas. For Ambrose and Muley in action together, check out “Rumpler Stakes” previously posted on AgeofAces.net. This month we’re celebrating the talents of that pulp stalwart—Joe Archibald. Archibald wrote hundreds of stories for the pulps, both dramatic and humorous. His bread and butter it would seem was the humorous tale. He had long running series in several pulp titles. In the detective titles there was Alvin Hinkey, the harness bull Hawkshaw, in 10 Story Detective; Scoops & Snooty, the Evening Star’s dizzy duo, in Ten Detective Aces; and the President of the Hawkeye Detective Agency himself—Willie Klump in Popular Detective. While in the aviation titles he had Elmer Hubbard and Pokey Cook in Sky Birds; the one-two punch of Ambrose Hooley & Muley Spinks in The Lone Eagle, The American Eagle, Sky Fighters and War Birds; and last, but by no means least, the pride of Booneville—Phineas Pinkham in Flying Aces! 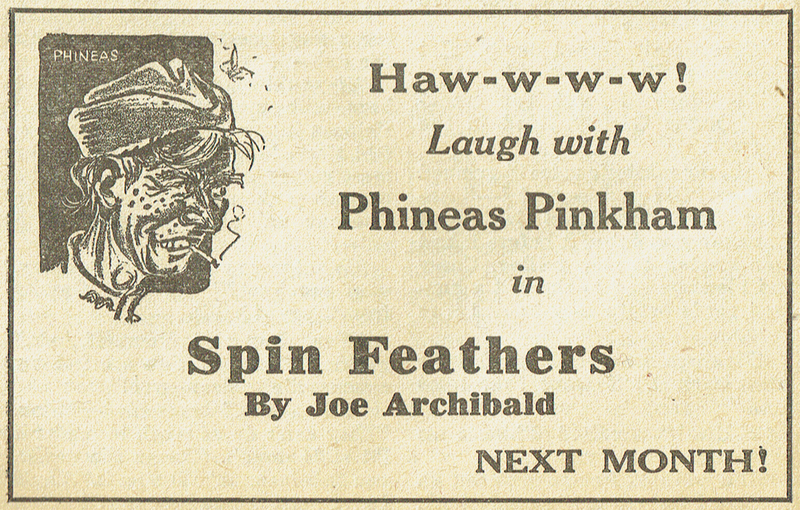 Joe Archibald’s Phineas Pinkham was the longest continuously running aviation character in the pulps. 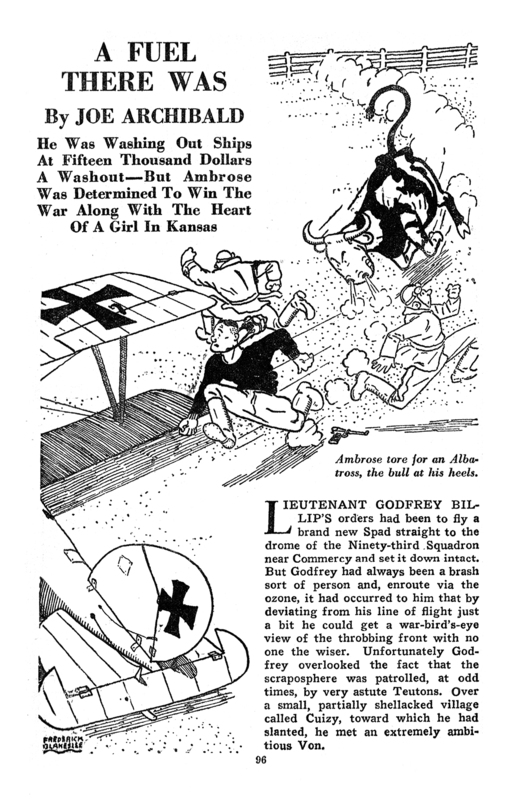 Running in the pages of Flying Aces from November 1930 until the magazine dropped it’s Fiction section in November 1943. In 151 stories, Pinkham bedevils the men of the 9th Pursuit Squadron, all the Hauptmanns and vons the Boche send his way and his hapless C.O. Major Rufus Garrity with his pranks, jokes and insane inventions that seem only to amuse Phineas. Major Garrity had an idea. It involved sending Phineas Pinkham back to training school in his stolen Fokker to teach rookies to fight. Phineas had an idea, too. It involved taking that stolen Fokker across the lines to teach the Mad Butcher not to fight. Lay your bets, gentlemen! 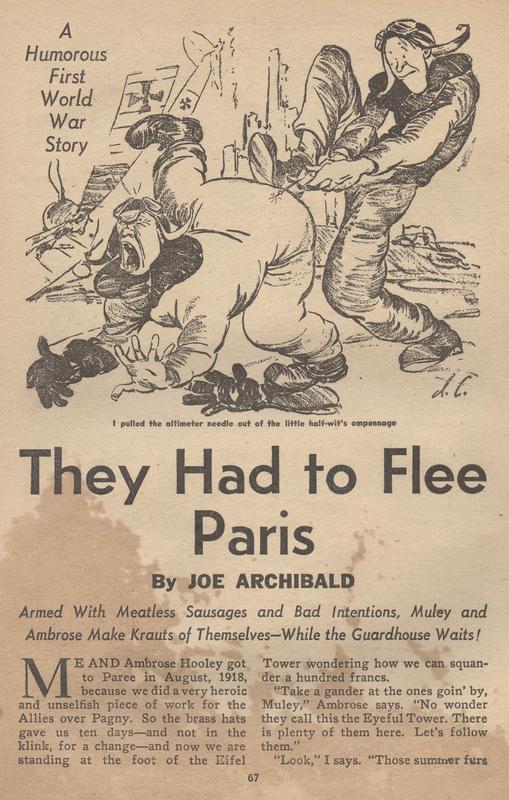 Editor’s Note: This story was posted a number of years ago, but this is an update PDF with Archibald’s illustrations included to add to the merriment!